Kalamazoo, MI January 27, 2016 – Kalamazoo Symphony Orchestra is one of only twenty-two orchestras from across the United States selected by the League of American Orchestras to receive a Getty Education and Community Investment Grant. 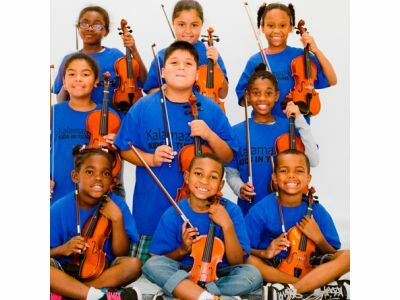 The grant was awarded to develop the orchestra’s Kalamazoo Kids in Tune program, and is a recognition of the KSO’s innovation and dedication to increasing its relevance to the community. Kalamazoo Kids in Tune is an after-school “orchestra immersion” program developed in partnership by Kalamazoo Symphony Orchestra, Communities in Schools of Kalamazoo, and Kalamazoo Public Schools. The program infuses a CIS after-school program (known as a 21st Century Community Learning Center) with an intensive music and orchestra curriculum developed by the KSO and based on the ideals of El Sistema, the groundbreaking Venezuelan youth orchestra model. Students attend four afternoons per week. Every child selects a string, wind, brass or percussion instrument and takes part in group lessons, orchestra, sectionals, and regular school and community performance opportunities. Program time also includes mindfulness practice and other activities to support the development of positive self-regulation. Each day begins with a meal and ends with supported homework time. The program was launched in fall of 2011 at KPS Woods Lake Elementary: A Magnet Center for the Arts. It currently serves 80 students and recently expanded from 1st-5th grade to include 6th grade “graduates” as members of the “KKIT Leadership” program. Waterbury Symphony Orchestra for Bravo Waterbury! The League of American Orchestras leads, supports, and champions America’s orchestras and the vitality of the music they perform. Its diverse membership of approximately 800 orchestras across North America runs the gamut from world-renowned symphonies to community orchestras, from summer festivals to student and youth ensembles. The only national organization dedicated solely to the orchestral experience, the League is a nexus of knowledge and innovation, advocacy, and leadership advancement for managers, musicians, volunteers, and boards. Its conferences and events, award-winning Symphony magazine, website, and other publications inform music lovers around the world about orchestral activity and developments. Founded in 1942 and chartered by Congress in 1962, the League links a national network of thousands of instrumentalists, conductors, managers and administrators, board members, volunteers, and business partners. Visit americanorchestras.org to learn more.